Staccato's involvement started with Paul Siciliano working with the guys at Cooch and Staccato hired Stephen Grant (previously worked at Disney) to help out on the character development. Once we had nailed the look and style. Paul proceeded to create the "man and his dog" in 3D. All clothing variations were selected approved and then also created in 3D. The next stage entailed Paul starting to block out the animation for timing and composition and Stephen got started on the background illustration elements. Animation was refined in multiple passes and WIP's. Sun position and timing had to match the bell curve and correlate to the UV Index at all times. Paul put all of the 2d illustration elements into a 3D scene, setup all lighting and shaders for the 3D characters, rendered out all passes which included the beauty/shadow/occlusion/sunscreen/clothing passes. All passes were then composited into the 3D scene with the background, graded and lighting effects added. Soundbyte created the great original music score and sound effects. Top row from left: Original character development sketches for the dude and his dog. 3D final dog character. Middle row: Early 3D model test for Jimmy and his clothing, Animation blocking pass. 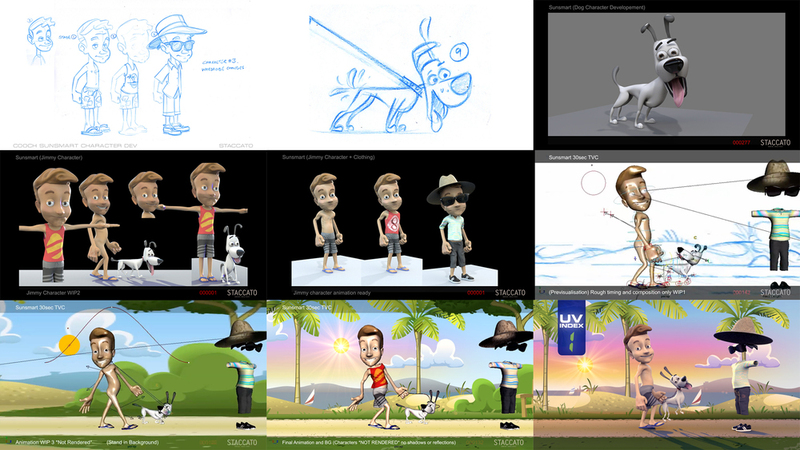 Bottom row: Various iterations of the animation and background to the last frame which is the final look and composite.